Rugby players bring World Cup fever back to Brazil. World Cup fever is set to continue in Brazil as universities across the globe are sending their best rugby players to battle it out on the pitch in Sao Jose dos Campos. Plymouth University BA (Hons) Photography student Charlotte Notman is one of 11 players selected to represent the UK in the 2014 International University Sports Federation, FISU World University Rugby Championships. 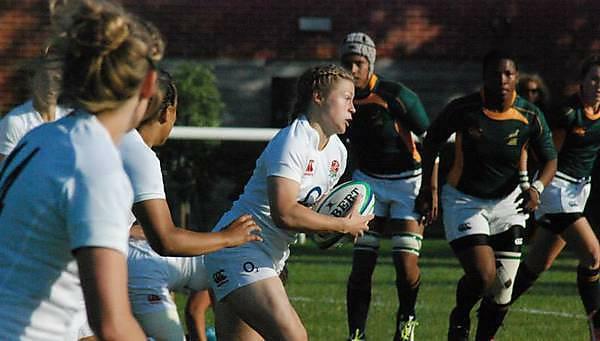 The rising star started playing at the age of ten when she joined her local rugby club. “When I was young, my parents encouraged me to participate in as many sports as possible, and for a long time dance was my main hobby, but I fell in love with rugby,” said Charlotte. She went on to play for the Newquay Tretherras at secondary school, joined the England U20 squad at the age of 17, and was part of the Varsity-winning Women’s Rugby Team at Plymouth University this year. The bi-annual International University Sports Federation event, officially formed in 1949 to promote sports values and practice, introduced the World University Rugby Championships in 2004. Now in its sixth year, the two-day tournament has seen the number of participants grow from nine countries to a record number of 17 in 2010. Set to compete against national teams from China, France and Canada, Charlotte has been preparing for Brazil by playing Premiership rugby for Bristol and Plymouth Albion.